Hyderabad: Information presented in audio and video formats tends to be more accessible to the users and should be used more to communicate in social media. When this information is true and delivered by credible people, it prevails over the untruths professed by detractors. 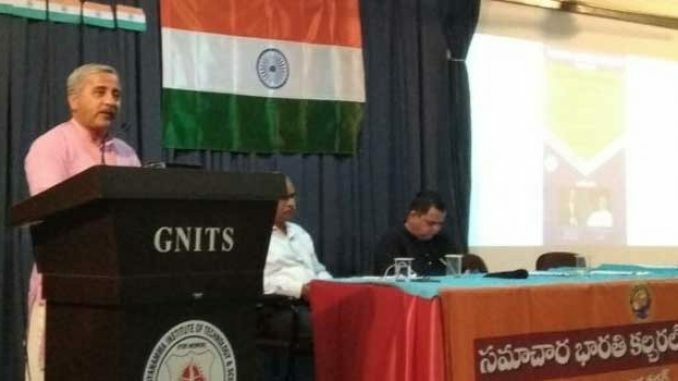 In social media era, it becomes our responsibility to use available social media tools to communicatie with the people of our country, by asserting our rich culture, values and greatness that needs to be preserved and handed over to future generations” said Milind Oak, CEO of Bharati Web, speaking at the Social Media Sangamam event in Hyderabad on 27 January 2019. Milind ji was speaking at SM Sangamam, organised by Vishwa Samvad Kendra, an initiative of Samachara Bharati, Hyderabad. Ayush, convener of Samachara Bharati, has presented a ppt on the various initiatives undertaken by Samachara Bharati to inform and enthuse all the interested volunteers to work for the national cause on various social media platforms. The theme of the first panel discussion was “Awareness of Culture & History through Social Media”. Smt Padma Pillai, a prominent Social media activist, said, “A strong eco-system particularly from the left oriented people is trying to establish a distorted narrative of Bharat and its culture. To counter this, people on social media should be better equipped with our traditional knowledge and take pride in celebrating it. Padma recalled her fight on the #SaveSabarimala campaign on social media and explained about how she overcame the abuse and trolling by so called liberals and feminists. Padmini Bhavaraju, from MyInd Media and Achamgaa Telugu spoke about the hunger of people for information on the cultural greatness of our country, and explained about their initiatives on web radio, telugu language books in script, audio and video formats that have become a huge success on their social media portals. Rathnakar Sadasyula, an IT professional, spoke about temples as cultural centers and explained about how such information can be presented in tweets and blogs to reach out to people. The theme of the second session was “Civic & Social Awareness through Social Media”. Ramamurthy Prabhala, an IT professional, explained their campaigns like #Run4girlChild on social media, which helped Seva Bharati in orienting and connecting people towards sewa activities that they have undertaken. Ashish Neradi, President of HSPA ( Hyderabad Schools Parents Association), explained how their social media campaign has taken on the strong commercial lobby in their fight regarding expensive school fees, and various strategies used by them on social media. He recalled the influence of SM when they had received overwhelming support from various corners of the country. Karuna Sagar, a lawyer by profession, spoke about how they used Social Media platforms in spreading legal awareness in the society. He narrated how it helped to prevent foreign evangelists to take up further canvassing, by exposing their violation of Indian Visa norms. Dr. Gaurav Pradhan, a data scientist and prominent social media activist, said, “Social Media is a powerful tool with an edge. The content should be researched, with no foul language, and embedded with facts. He emphasized on the correct utilization of available Social media platforms by understanding the target audience, while also avoiding mixing up of personal issues with other issues on social media profiles. Gopal Reddy, president of Samachara Bharati, and N Ayush, convenor of SB, Pradeep, Srinivas, Aradhana, Santosh, Bhikshapati and many social media activists and students participated in the day-long event.